“After investigating, we concluded that Mekorot came to Argentina with the intention to repeat what they are doing in Palestine. Water is a right for all and no company should be able to provide water in a discriminatory way,” said Adolfo, an engineer and a representative of the CTA/ ATE Hidráulica trade union in Buenos Aires that campaigned against the Mekorot plant. 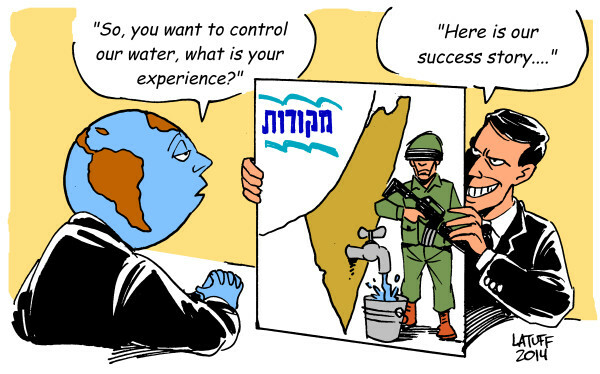 “We fought in solidarity with the Palestinian struggle for justice, liberation and return and we won a battle not only against Israeli crimes against the Palestinian people but as well for the right to water here in Argentina,” said Tilda Rabi, president of the Federation of Palestinian-Argentinian Organisations. Campaigners understand that the decision was made in December 2013 but were only able to verify the news on March 7. Friends of the Earth Palestine and a range of BDS partners are calling for a week of action against Mekorot during the last week of March. Campaigners are viewing the Buenos Aires decision as the latest sign that the international BDS movement is increasingly isolating Israel and having serious economic impacts on its regime of occupation, colonialism and apartheid. On Thursday, students at the National University of Galway in Ireland voted to endorse BDS in a campus wide ballot, following on from a similar referendum success for BDS activists at the University of Windsor in Canada. National and local student unions across Europe and North America have now voted to support BDS-related measures. Israeli media reports attributed the recent withdrawal of two leading European construction firms from the bid to build seaports in Israel to boycott fears, and a third firm only agreed to go ahead with similar plans after being allowed to submit a bid under a different name. It emerged last month that Luxembourg’s state pension fund has excluded nine Israeli banks and firms over their role in illegal Israeli settlements, following on from similar decisions in recent months public pension funds in Norway and the Netherlands and Danske Bank, Denmark’s largest bank. A recent solidarity conference organized by South African members of parliament and civil society groups issued the Cape Town Declaration endorsing BDS and accusing Israel of the crime of apartheid. The Norwegian branch of the YMCA-YWCA movement recently announced its support for an economic boycott of Israel. “Israel’s attempts to smear the BDS movement are failing; Israel is increasingly being isolated as people of conscience around the world take action to support Palestinian rights and as investors realise that there are serious economic and reputational risks associated with doing business with Israel,” said Zaid Shuaibi, a spokesperson for the Palestinian BDS National Committee, the largest Palestinian civil society coalition that leads the global BDS movement. “Boycott is becoming an increasingly powerful and empowering way for ordinary people to support Palestinians in their struggle to end the occupation and Israel’s apartheid policies and for the right of Palestinian refugees to return to their homes,” he added.